Posted on Wed, Jan 18, 2012 : 12:39 p.m.
Ypsilanti’s new Michigan General Store celebrated its grand opening on Saturday, a little over a month since the store opened on Cross Street in Depot Town. The bustling event featured vendors who passed out samples of products carried in the store and DJs for entertainment, the Ypsilanti Courier reports. Among the vendors: Perkins Pickles, Malcolm Tradition Gourmet Shortbread Cookies, Arbor Brewing Company, Frog Island Brewing Company and J. Trees Cellars. Mark Teachout co-founded the MI General Store next to Cafe Ollie in Ypsilanti's Depot Town. 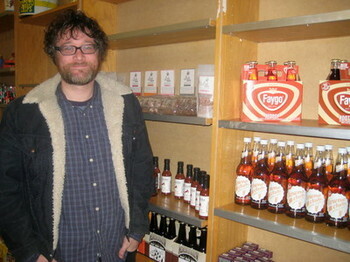 The gourmet specialty shop opened Dec. 12 at 44 E. Cross St. It features made-in-Michigan products and primarily sells wine, beer, chocolate, snacks and cheese. The plan is also to offer beer and wine tastings and act as a venue for artists to perform. The owners, Mark Teachout and Danielle Schwerin, own the neighboring Cafe Ollie, which opened in January 2011. Teachout said business in the Michigan General Store’s first month has been good, according to the report. To read more about the grand opening, check out the full article here. Thu, Jan 19, 2012 : 9:51 p.m.
Congrats on the opening! Now, maybe AnnArbor.com will cover the grand opening of Lily Grace that happened in December? Thu, Jan 19, 2012 : 1:34 a.m. I have to say the best part for me was the Chateau Chantal wine tasting. The Chardonnay is probably the best Chardonnay I have tasted from Michigan. Bravo Chantal!